499 feet in cf? Wow! Wow, that's 399. Don't know how I didn't see that. About the cap logo, are you concerned about the Kelley green not standing out? I suppose I could lighten the green a touch. I think the lighter green would work. Or maybe you could make the front panel of the hat white/cream for something unique to the team. We're the fireflies, but nobody remembers or cares. also, might not want to use "BBC" in a logo. the bridge between St. Louis and Milwaukee was burned to the ground. I can't say I'm surprised, they bridge is 370 miles long. Jokes aside, I love this series. 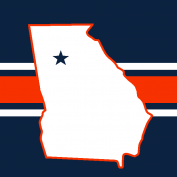 I was not a fan of my hometown team, but I understand the reasoning. Chicago is gorgeous, in particular, I want to call attention to that. Nashville also deserves a shoutout. I'm sure that won't make rebuilding it any easier. Thanks! SanFran (I assume is your team) was one I was shaky about when I first posted, but I think it's growing on me. There's talk that the road script will be changed for 2016, but that's not totally settled. Anything else before I put up the next team? Hard to believe we're close to being finished. New York, actually. I understand your confusion, though. The Masons have a nice, classic look. The navy and kelly green complement each other nicely, and the slightly custom block fonts are a great touch. I don't think the green diamond being hard to see is a huge issue. The focal point is the "B", which stands out fine. Though maybe a cream-front-paneled hat would be cool to see with the home alt. Also, I'd lose the green outlines on the home jersey. They blend with the pinstripes and muddy the look quite a bit. Once again, you have done very well. I'm sure conspiracy theorists would have a fit with a team called the Masons. I do think you should go with navy pinstripes. 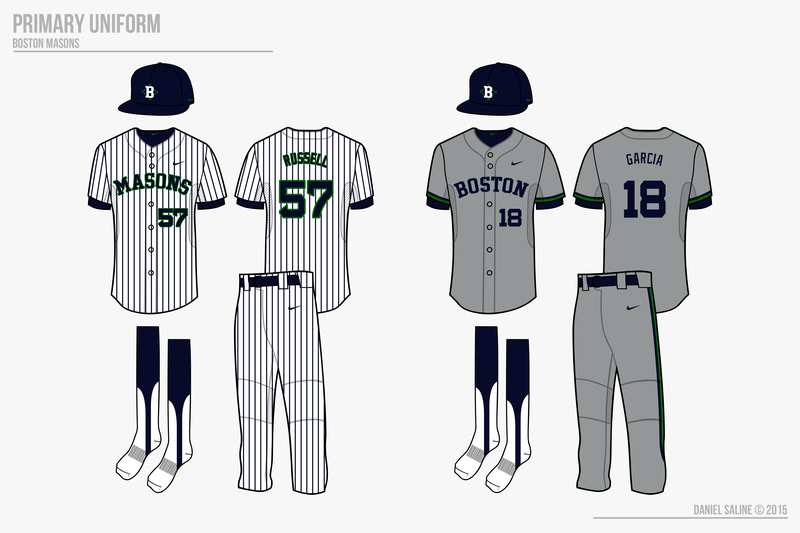 Usually teams use their darkest color for the pinstripes, and I think a team as traditional-looking as Boston should go with dark pinstripes. The light pinstripes worked for Nashville since they are a more modern team, but it looks odd on such a traditional team. 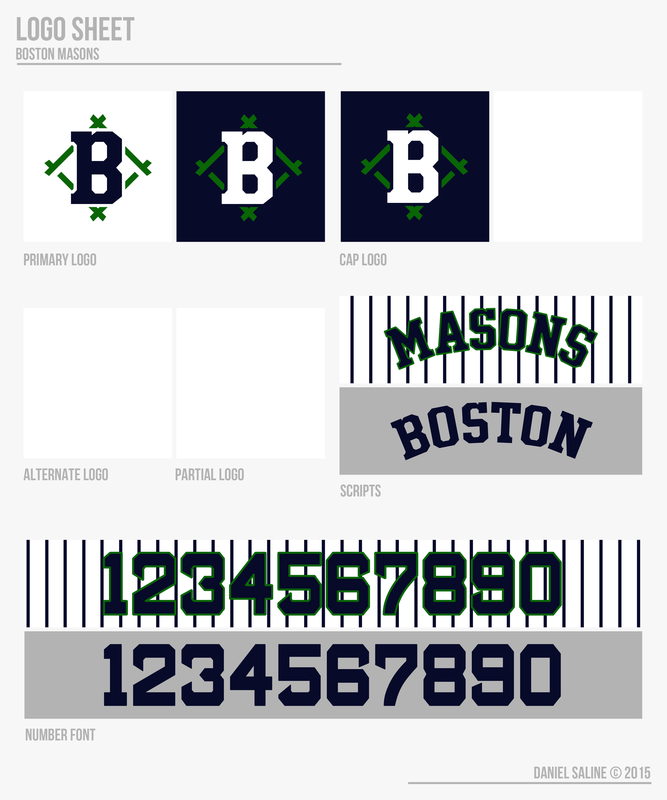 The goal was to model them after the recent Astros update, so modern-looking pinstripes wouldn't be too far off. 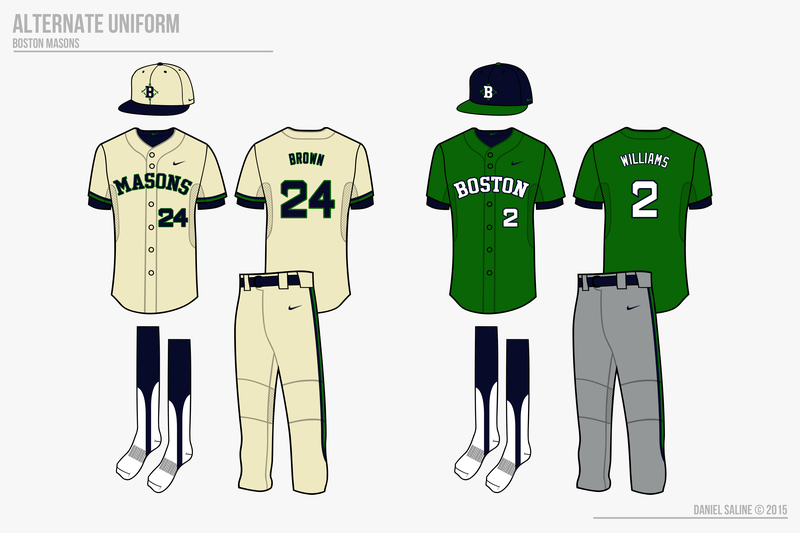 Here's what it would look like with navy. I added back the green outlines so that there'd still be green in the jersey. I think I was hesitant to do this at first because of how similar it is to the Yankees, even though they don't exist. I'll work out the rest of the problems soon. 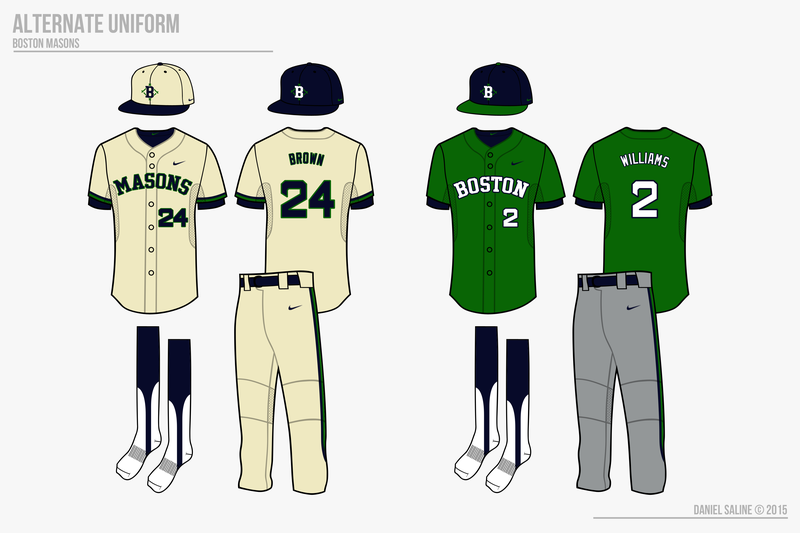 I prefer the navy pinstripes. I'm not a big fan of white hats (or cream in this case), but it does achieve a throwback feel. Maybe have them wear their regular hats most of the time but leave the cream hats as a throwback/fauxback option. Maybe its just me, but the numbers look like they've been stretched a bit on the back. The vertical sides seem very thin. 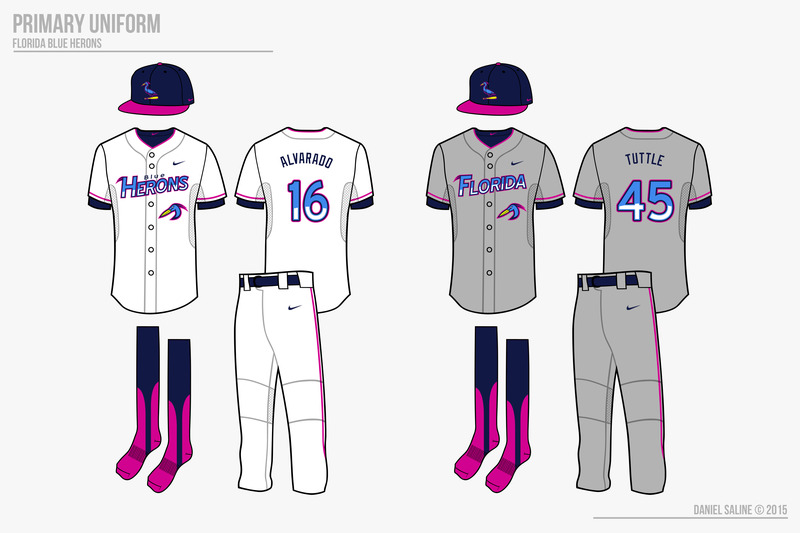 I like the idea of using both hats for the fauxback jersey, like davidmiller5. 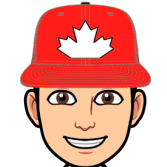 Favourite Logos:New Jersey Devils green and red logo, All Milwaukee Brewers logos. Are you going to do the defunct teams of the USBL when your finished the 20 teams? I already know it's Miami based on what you said. 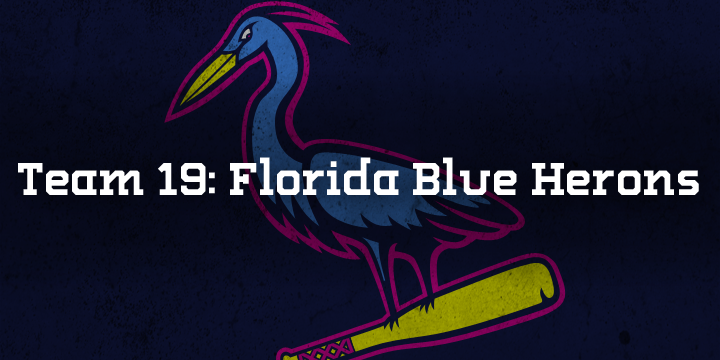 The Florida Blue Herons, commonly shortened to Herons, formed in 1962 in Miami. It was baseball’s first team in the South, and fans in that entire region immediately embraced them. In fact, the Herons have a top 3 fanbase in the USBL to this day, even with a number of lackluster seasons. The nickname was suggested by Governor LeRoy Collins in 1959 because he “frequently saw herons” in his yard and eventually chosen by the original ownership. Although they only tack two Branson Cups to their name, there have been a few bright spots in the past. Wendell Barrett was the team’s first pick in the expansion draft and didn’t disappoint in his 11 years in the Sunshine State. Barrett was a super-utility man as a catcher and middle infielder and was the first Blue Heron to be inducted to the USBL Hall of Fame. A few years after his retirement, he became the manager for the club, leading them to their two titles in 1976 and 1980. Cody Hunt was the MVP in both of those seasons as a centerfielder and emergency pitcher with 7 total homeruns and 16 RBIs. As of today, Florida sits in the cellar. 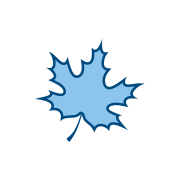 The Blue Herons are 53-67 and 17 games behind the first-place Suns in the American Division. They didn’t make any moves at the deadline, as they are currently trying to rebuild their club, but there are two exceptional young pieces on their roster. One is Anastasio Alvarado who captains the outfield and has been in the Rookie of the Year conversation since the spring. The second is Willie Tuttle, a first round pick with ace status and at the young age of 25. As long as these two young studs are on the Miami diamond, the Blue Herons may have success in front of them. It’s not like there is a losing culture in Miami; they made the postseason in 2013 with 93 wins. The Herons moved into a new home this year, leaving behind the tired Wendell Barrett Memorial Stadium. “The Barrett” was used annually for both football and baseball, and hosted a handful of soccer games as well. While the team certainly was due for a new facility, fans grew to love The Barrett, mostly out of nostalgia. 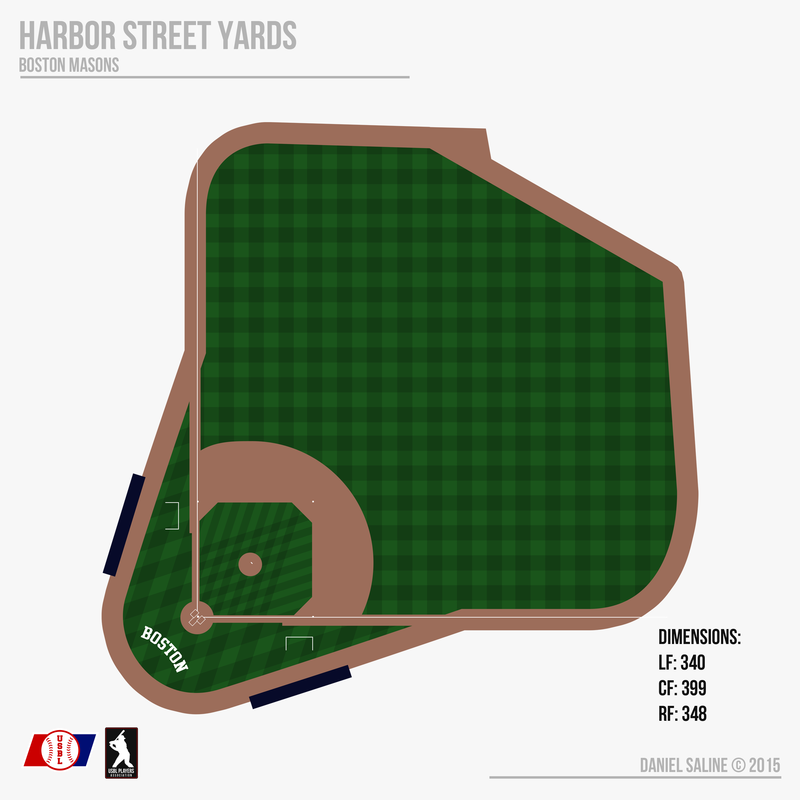 It was replaced by Burger King Ballpark three blocks down, a modern stadium which contains the largest videoboard in the USBL. 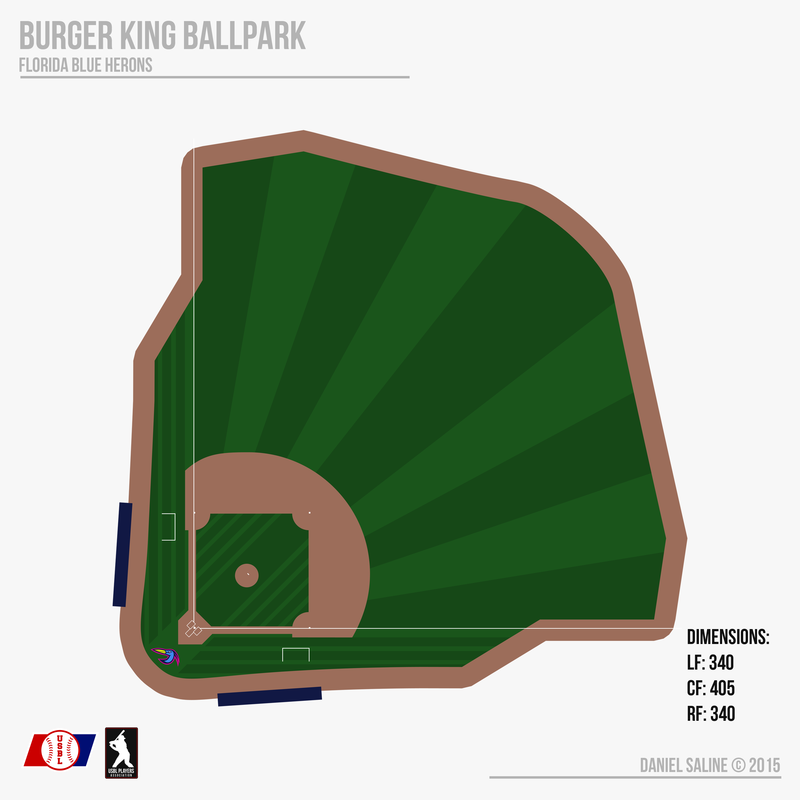 It was nearly called Wendell Barrett Memorial Stadium II, but Burger King is shelling out $17 million a year in naming rights, those bastards. Possibly my favourite! Love the colours, it matches Florida well! At first I was skeptical, but the set kept growing on me and now I'm a huge fan! 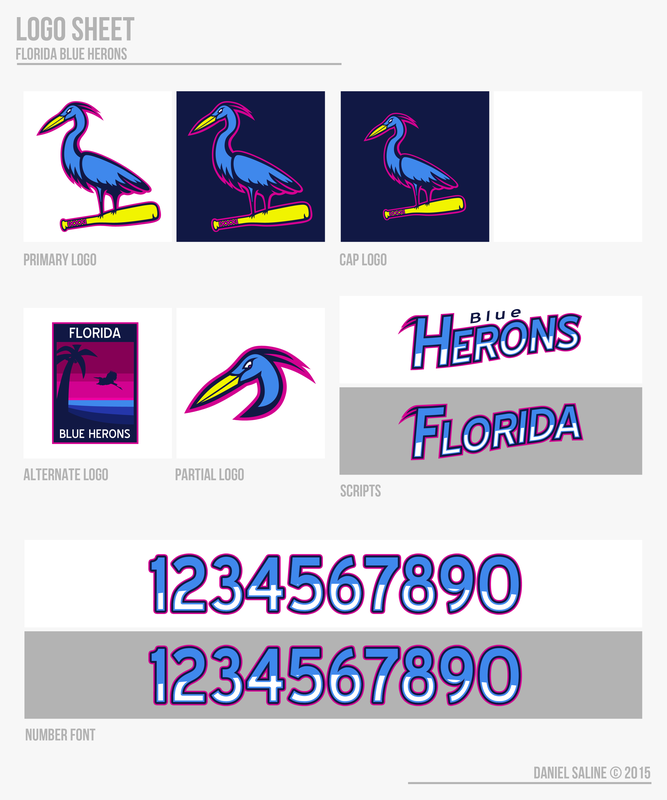 The primary bird logo is marvelous... When you get a chance, could you give us another update on the standings? I agree, but that wasn't necessarily the point. It's not really used except around the stadium and on tickets because of that. It's designed to emulate a tourist-y poster, and is hard to come by on a lot of apparel. 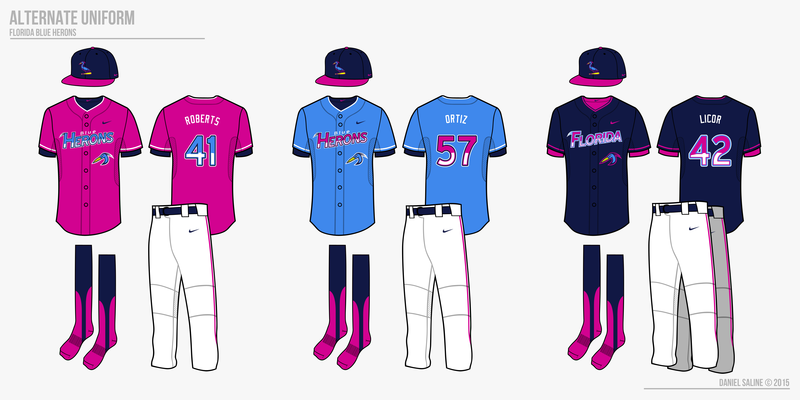 And yeah, I liked how the Blue Wahoos used pink in their set, that was my initial inspiration.